Every December, F&W editors get urgent phone calls from friends and relatives in need of wine-buying advice. But the truth is, we have our own wine dilemmas to deal with! Let them be a lesson to you. "I love to give wine as a gift, but it's hard to wrap. Wine bags are the answer, but I won't settle for the metallic Mylar bag you get for free when you buy a bottle at a shop." 1. Hero Bags Picnic Tote Made from silk-screened canvas, this roomy tote has a pocket for bottles and space for food. $35; herobags.com. 2. Anna Street Custom Wine Bags Bags from Anna Street can be custom-made in patterns from plaid to striped. $17; annastreet.com. 3. South House Boutique You can scribble a personal message on the chalk-fabric label, or number bottles for a blind-tasting party. $20 for 4; etsy.com. 4. Jamie Dallas Thompson These monogrammed beehive-fabric bags come in two sizes and a range of colors. From $36; etsy.com. 5. Brunello Wine Tote Insulating neoprene fabric helps keep bottles cool; an outside pocket holds a corkscrew. $30; rhinowinegear.com. "Every Christmas I go home to Australia, where, of course, it's summer in December. So instead of big roasts and warm side dishes, my family serves cold cuts and salad. Big reds aren't the answermy solution is to serve really herbaceous, crisp Sauvignon Blancs from New Zealand, or unoaked Chardonnays from Australia's Margaret River region." 2009 Dog Point Vineyard Sauvignon Blanc ($20) Fresh and citrusy, this bottling from New Zealand's Marlborough region comes from two winemakers, Ivan Sutherland and James Healy, who learned their craft at what is arguably New Zealand's most famous winery, Cloudy Bay. 2009 Babich Marlborough Sauvignon Blanc ($14) Roger Lassarat Saint-Veran Cuvée Prestige. Photo © Antonis Achilleos. "My problem is simple: My in-laws don't drink white wine, ever! And I like drinking white wine, even in winter. So I had to come up with a white wine to change a red-wine drinker's mind. That proved to be white Burgundy, which tends to have more savory notes than domestic Chardonnays." 2007 Roger Lassarat Saint-Veran Cuvée Prestige ($23) Burgundy's southern Mâcon region can be a great source for valuesat least as far as Burgundy goes. Lassarat's bottling is layered and elegantly spicy. "Almost every year I go home to Texas for Christmas, and I eat the one thing I don't seem to be able to find in New York: great Tex-Mex food. 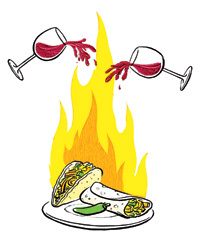 I've discovered that a juicy, fruit-forward red without a lot of tanninssince tannins accentuate the heat from chilesis pretty much ideal with tacos, enchiladas, fajitas and other spicy dishes." 2007 Giacomo Borgogno Barbera d'Alba Superiore ($19) Borgogno has been known for its traditionally styled Barolos since the 1700s. But its berry-inflected, smoky Barbera is the steal in the winery's impressive portfolio, especially in the terrific '07 vintage. "Every year, I put together a case of wine for my parents. My mom likes a combo of low-alcohol reds and full-bodied reds, while my dad has a predilection for Rhône-style whites. Of course, if I asked him what a Rhône-style white was, he'd have no idea; I've just noticed he always likes those wines. This year, I added a Picpoul from the Languedoc to the mix for him, because it's what I poured at my wedding in October." 2009 Domaine du Pioch d'Or Picpoul de Pinet ($14) Picpoul de Pinet, a little-known white variety native to southern France, produces zippy, grapefruit-scented whites. This old-vine bottling from the Gaujal family is particularly compelling. 2008 BenMarco Malbec ($20) © Alex Nabaum. "Over the holidays and winter months, I make a lot of rich dishes that call for a dash or more of wine, so I pour any leftover red I may have into an ice cube tray and freeze it. Then I pop the cubes out whenever I need them. So I require wine that's affordable enough that I don't mind freezing some of it, but good enough that I still want to drink it." 2008 Tapeña Garnacha ($10) A fruity red with plenty of cherry flavor, this exuberant wine comes from the sprawling Tierra de Castilla region southeast of Madrid. 2007 Routas Cyrano Syrah ($17) Deschutes Jubelale. Photo © Antonis Achilleos. "Whenever I have a holiday or New Year's Eve party, half of my guests are big-time foodies and really into good wine, and the other half are content with Budweiser. So for the wine fanatics, I buy some really great bottles for the first half of the evening that are esoteric but affordable, like Torres's Viña Esmeralda. Then I switch to an affordable cava like Poema and a good selection of holiday craft ales." Deschutes Jubelale ($1.50) Deschutes, one of Oregon's top craft breweries, has released this dark, malty, winter ale every October for the past 22 years. NV Poema Cava Brut ($12) Like all cavas, this sparkling wine is a blend of the Spanish grapes Macabeo, Xarel-lo and Parellada; unlike some cavas, it's complex and subtle. 2009 Torres Viña Esmeralda ($15) Spain's Torres is known primarily for its intense red wines, but it also produces this unusual, aromatic blend of Moscatel and Gewürztraminer. "I always have a holiday dinner for 20 in my small Brooklyn apartment and ask people to bring wine. To make that easier, I share my list of evergreen, affordable bottles that are very food-friendly." 2008 Selvapiana Chianti Rufina ($17) Classic cherry flavors. 2009 Renato Ratti Dolcetto d'Alba Colombé ($16) 2008 Benton-Lane Pinot Noir. Photo © Antonis Achilleos. "My family makes a classic cheese fondue every Christmas Eve. We love that it evokes the feeling of a cozy, snowy evening in a Swiss chalet, plus it's communal and fun. I like to pour an earthy, softly tannic Pinot Noir with all that cheese." 2008 Benton-Lane Estate Grown Pinot Noir ($26) Benton-Lane's estate bottling has earth and spice notes, plus vibrant cherry fruit. It's from Oregon's 2008 vintageone of the state's best ever, thanks to a nearly perfect growing season.